Ten years ago, it was hardly an unusual sight to see Louisville, Kentucky, police officers converging on Boston Court in the Shawnee neighborhood. Back then, it was the epicenter of drug and crime problems in the area. But that was before The Fuller Center for Housing came along. Local leaders went to city officials and said they wanted to hit the ground running and begin their work in the top problem area. The city sent them to Boston Court. What was once the epicenter of crime in the city has since become the epicenter of the West End’s transformation, and The Fuller Center’s most striking example of how once-vacant properties can become like-new homes again. Last week, metro police again converged on Boston Court. But this time they were there to help homeowners spruce up the neighborhood even further, along with several other local volunteers. 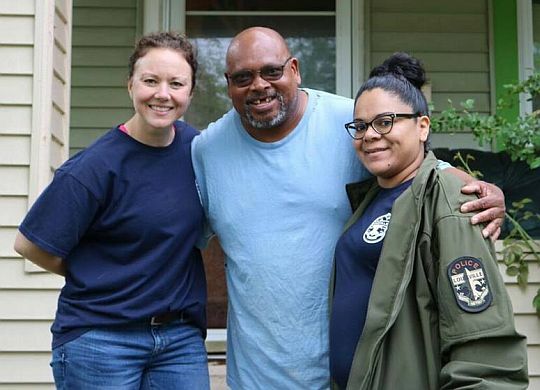 WDRB-TV caught up with the volunteers and Fuller Center of Louisville Executive Director Cornelius Butler during Mayor Greg Fischer’s Give A Day week of service on Boston Court and produced this video update that you can view at this link.